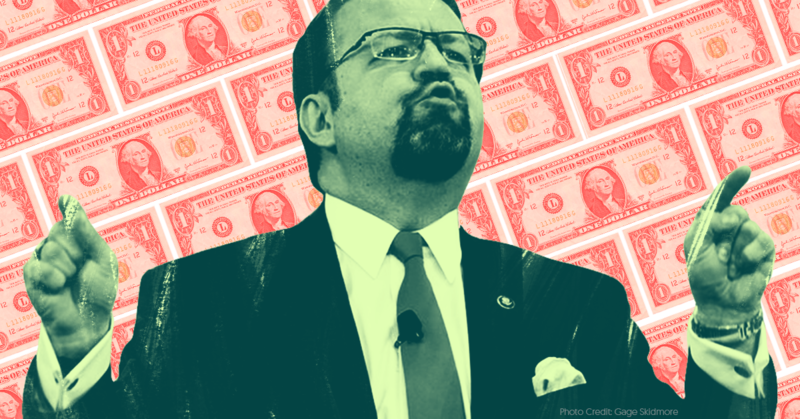 Gorka's been cashing in on his ties to Trump while railing against "the swamp"
It’s been almost a year since off-brand James Bond supervillain Sebastian Gorka was fired or resigned (definitely fired) from his ill-defined job in Donald Trump’s White House, and Gorka is still finding ways to monetize his seven months of public pseudo service. He’s followed some well-worn D.C. insider tracks by signing on as a Fox News contributor and guest lecturer at the Heritage Foundation, but he’s also running a side hustle squeezing speaking fees and the occasional “honorarium” out of Republican congressional candidates. In exchange for the thousands of dollars it costs to have Gorka speak on their behalf, these candidates get a full dose of the only commodity Gorka has to offer: his proximity to Trump. Obviously this is a good deal for Gorka; all he has to do is show up and ramble for a few minutes about the president and he gets a tidy little sum to finance his suede-vest-and-tourniquet lifestyle. But is it worth it for these campaigns to pay Gorka to hear him drone quite Britishly about the unblemished greatness of Donald Trump? Yeah, probably … for now. Ever since the 2016 election, Republican politics has devolved into a grim and undignified competition over who can best communicate their slavish and self-debasing loyalty to the president. For as long as that dynamic lasts, having a Trump-adjacent minor celebrity like Gorka on hand to lend a bit of insider credibility doesn’t hurt, just so long as everyone agrees to overlook the fact that the transactional nature of the relationship is the very essence of the “swamp” they all claim to loathe. Gorka’s sinecure at Fox News is also quite swampy. As I wrote when Gorka was first hired by the right-wing cable network as a “national security strategist,” Gorka had no actual national security role in the White House, and real security experts view him as a jumped-up charlatan. He’s functionally useless at the specific role Fox News hired him for, and Fox News apparently acknowledges as much. Once again, Gorka’s only valuable contribution to Fox News is his relationship to Trump, who apparently loves watching Gorka’s cable hits. The network’s pro-Trump propagandists understand this, so they invite the nominal “national security strategist” to bark about whatever story they’re chasing on a given evening. Sometimes those stories are national security-related, but more often than not Gorka is brought on to inveigh against the media or the Russia investigation or “the cesspit, the cesspool that is Hollywood.” It’s a racket that’s made possible only by the president’s affection for Gorka’s brand of combative nonsense. Gorka is a bleak manifestation of this rancid era in politics. Through dogged loyalty to a corrupt politician, he briefly rose to an official position that far exceeded his qualifications. Now he’s running tidy little scams wherever he can and eagerly invoicing whomever is willing to hear increasingly stale anecdotes about his undistinguished few months spent in service to Donald Trump.